→Why Do Runners Wear Arm Sleeves? WHY DO RUNNERS WEAR ARM SLEEVES ? From baseball to basketball and football to even golf, we see compression arm sleeves almost everywhere. We have seen well-known athletes like Derek Jeter, LeBron James and other popular sports person using these arm sleeves on the court and field. All this heightens our curiosity, and we are compelled to ask- what actually these arm sleeves are? How do they benefit us? Do they really work? What are Compression Arm Sleeves ? Compression arm sleeves like other compression gears are basically fabricated from an elastic material. The arm sleeves are designed to tighten your muscles because it enhances your blood circulation. Thus, these sleeves have become much more than a fashion fad today and are eagerly used by everyone whether they are professional athletes, serious marathon runners or casual fitness enthusiasts. But do you ever wonder who made these arm sleeves an important sportswear of today? There is a history of compression arm sleeves that dates back to some six decades ago. But the sleeves were then used to treat venous diseases. The doctors found them really helpful in compressing blood vessels, which improve blood flow and ensure more oxygen-rich blood to muscles immediately. From venous treatments to today’s sports world, sleeves have transformed a lot. But the arm sleeves got their ultimate fame when Allen Iverson wore a sleeve in 2000 because he was suffering from elbow bursitis. He recovered very quickly with the help of that sleeve and continued wearing it to all his basketball matches from then. That initiated the revolution of the arm sleeves that we see today and made them so popular among sports-lovers. Here are the ones we recommend with detailed review below. Compression Arm Sleeves: protect skin, relieve pain and make arms feel better. What are the benefits of using arm sleeves? If the popularity of arm sleeves is still making you curious, read on to know its numerous benefits. There are innumerable reasons to use arm sleeves ranging from speedy recovery to increased comfort while playing. The below-mentioned benefits will clear all your queries regarding- why do runners wear arm sleeves? Improve Circulation:﻿﻿ Improved blood circulation is undoubtedly one of the biggest advantages of using arm sleeves. The high compression factor of these sleeves is intently devised to contract your blood vessels in the arm. These sleeves force the vessels to open up and circulate blood more efficiently. The tightened muscles of the arm stimulate the heart to pump more oxygenated blood to the arm. An improvement in the blood flow has another benefit, and that is to lessen the possibility of swelling during exercise or after some serious injury. 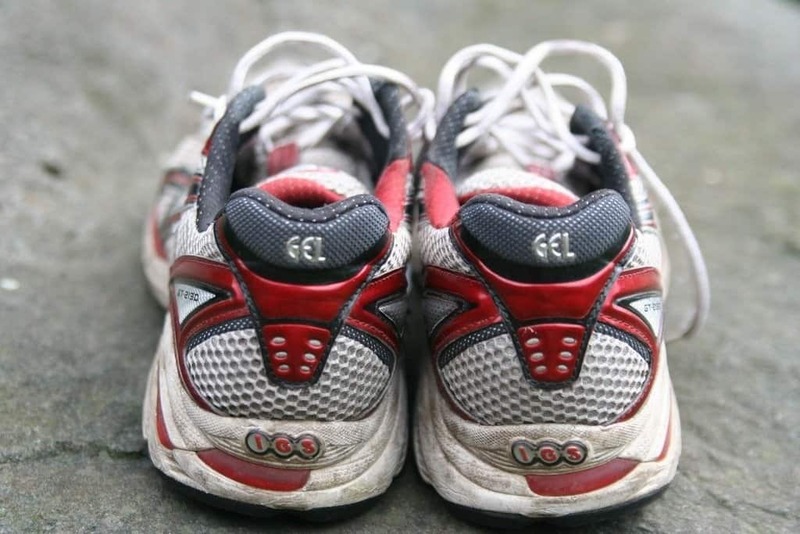 It can also protect your muscles from possible injury and support any previous injury you may have had. Quick Recovery:﻿﻿﻿ With the use of arm sleeves, athletes can experience fast recovery, and this is also proved in a study published by the American Journal of Medicine. The study was performed on several sportsmen wearing sleeves and results were compared to those who did not wear arm sleeves. It revealed that the compression sleeves keep the lactate levels in the muscles low which prevents swelling and promotes recovery. However, you must make sure to use graduated compression sleeves that are tight on wrists and slightly loose at the biceps. It quickly helps the blood flow back to the heart. Maintain Body Temperature: Weather is always unpredictable no matter where you are training. It could be raining or snowing someday while on other days the sun makes it scorching hot. Thus, it becomes highly inconvenient to put on and remove layers now and then while practicing. But the layer of a compression sleeve will ensure a moderate temperature of your body. They minimize the impact of weather impressively and also keep you warm and dry by wicking away the unwanted sweat. Protection: Apart from ensuring maximum protection against injuries, the arm sleeves also provide protection from sun, bumps and scrapes. However, hard you may try to avoid the swiping hands of defenders; the scratches and bumps are inevitable. 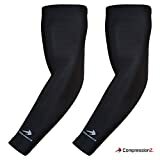 It is very likely to get scratched or bruised during the heat of game but the compression sleeves carefully form a layer between your skin and contact. So, the arm sleeves eliminate any such chances of getting wounded effectively. To better understand the benefits of compression arm sleeves and why do runners wear them; you can also view the video below. This video will easily illustrate you the several reasons for which athletes love using compression sleeves on the court or on the field. What to look for when buying an ar​m sleeve? The markets are jam-packed with a huge variety of arm sleeves. The options in terms of compression arm sleeves may leave you wondering for what choices to make. Only a picture-perfect and high-quality arm sleeve can offer all the benefits of compression sleeves. The foremost factor to consider while purchasing an arm sleeve is size. Size is the most crucial thing in an arm sleeve because it should not be too snug or too loose so as to lose its overall significance. There are size charts provided by various manufacturers that will help you pick the best arm sleeve. The second point to consider while purchasing an arm sleeve is to know what sport you are going to use these sleeves for. Depending on your sport, whether it is tennis, basketball, baseball or any other game, you can choose a sleeve. The game or games you participate in eventually determines the use of sleeve and also defines its limitations. The color of the sleeve is another important consideration. White and light color sleeves for outdoor sports can get dirty easily so you may need some dark colors. The color of your jersey will also influence the color of your arm sleeve. You may need a sleeve that complements your sportswear to add style to your game. So, there are many choices and considerations when it comes to compression arm sleeves. A compression arm sleeve can become your best companion in your sports that will protect you from injury, promote your recovery and will make your sports stylish. However, you must keep your approach practical because this is not a magical wear that will transform you into some superman. It will can work and will help you a lot in your athletic life. We evaluated the top 4 compression arm sleeves based on the following criteria: reviews, feedback, price (value) and most importantly, effectiveness. IMPROVE RECOVERY TIME: Are your biceps, triceps, arms or elbows sore after training or playing sport? Now you can improve recovery time & get active again sooner using our arm compression sleeves because we have true graduated compression of 12 - 16 mmHg in the sleeves that helps boost circulation in the arms. You will wish you found this sooner! BUY 100% RISK FREE: We believe our arm compression sleeves will be the best choice for you! So we've decided to take all the risk onto our backs. Put us to the test! Use our compression arm sleeve for up to 90 days, risk-free. If for any reason you are not completely satisfied, simply let us know & return the product for a FULL refund or a replacement. PAIN RELIEF: Use as an elbow brace for arthritis, tendonitis, lymphedema or other medical problems associated with the upper arm or forearm. Reduce swelling and inflammation from athletics such as tennis, CrossFit, golf and weightlifting. 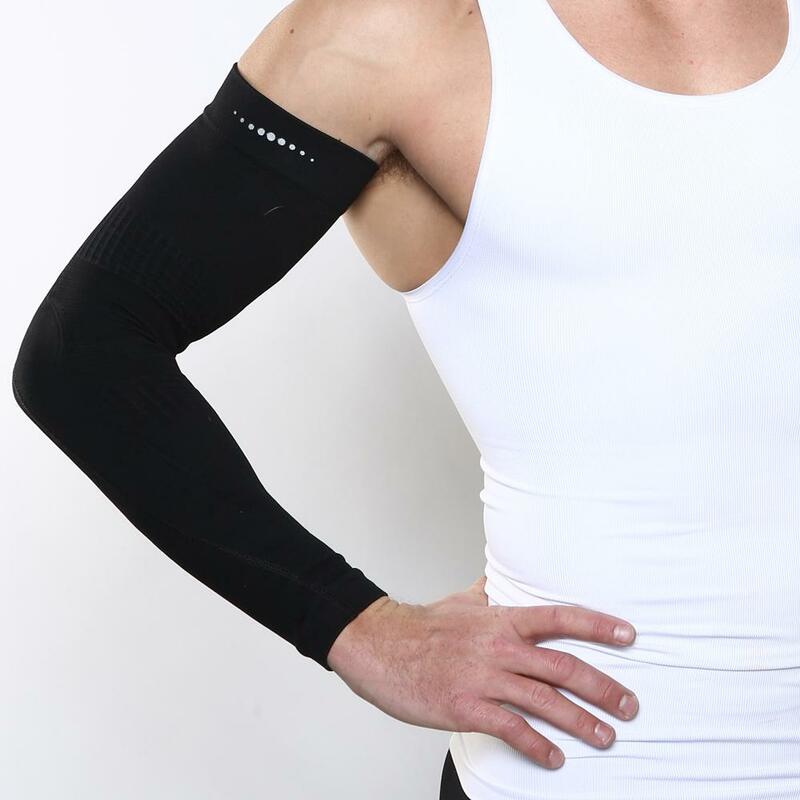 VERSATILE: Sleeves act as arm warmers in cold weather, or as a tennis elbow brace or arm sleeve for volleyball, bowling, football, or baseball for joint support and reduced swelling. Can also be used as a tattoo cover up sleeve. QUALITY YOU CAN TRUST: Our arm sleeves for men and women are comfortable and breathable. Each arm compression sleeve is crafted from lightweight material that stays put, boosts blood circulation, wicks away moisture, and protects against UV rays. MAKE HEAVY SORE ARMS FEEL BETTER INSTANTLY with faster circulation from fingers to shoulders with our 10-15mmHg graduated compression arm sleeves. TAKE THE CHILL OFF WITHOUT BULKY SWEATERS and regulate your temperature easily with easy on - easy off quick dry knit. PROTECT YOUR SKIN FROM SUN, road rash, wind & cold. Multipurpose rash-guard gives added support during sports, leisure or work. COMPRESSION TECHNOLOGY: Athletically designed arm compression sleeves to protect your arms and relieve lymphedema pains. Superior support to promote relief and rapid muscular recovery. BREATHABLE MATERIAL: Professional grade material (nylon & lycra blend). These athletic arm sleeves are designed for all day comfort and compression. Engineered to relieve arm pain, elbow pain, swelling, soreness and discomforts.